There are moments when you must find the part of you that knows you best, especially when your soul is weak. When I am unable to find it, I just run to nature for she almost always knows the way. I called frantically this morning….”Please be open, please be open….”. The recording came on, the blueberry patch was ready to offer all it’s goodness to my tired and depleted mind. I follow my children as they run under the tiny branches, they fit perfectly while I duck and push my way through the grove. Clusters of blueberries hang from every branch, they are everywhere we turn, different shades of blue and purple. It feels as though we are in a C.S. Lewis book. My soul is the most peaceful it’s been in months. “Can you guys believe this?” I say. “Nature is awesome!” Josiah yells. “I can’t stop eating them…” Jack replies. “You can’t resist nature…” Josiah responds. It’s so true. I can’t resist nature, it can travel to almost any place in my heart leaving behind a healing salve. The air is unseasonably cool and we imagine we are birds living in a blueberry forest. Lucy picks white unripe berries because they are different. I find Jack playing rock, paper, scissors with a bush. Josiah asks who is winning, Jack sighs and says the trees always win. Josiah leads and takes us to the quietest place that almost seems untouched. I pick and pick and pick…soaking it in because the kindness of this place is so sweet. 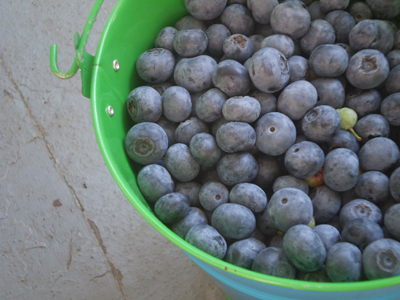 your blueberries are MUCH better……scotty was lazy so i was stuck with sub-par berries from his pound. so glad you use a metal bucket – hope the berries went krplink, krplank, krplunk! one of our favorite family traditions too!! big hugs…. Yeah so are you going to give up the location of the magic field or what? Is it a secret stash? It is probably too late now. Call me.